Infochammel is magical place. We talked about this site briefly on our Cellar Door as one of the few cool sites out there. But we feel it deserves its own article! The activity of that site is booming and shaking. To top it all off we had decided to advertise there now too! What the hell is Infochammel?!?!? If you check out their website. Or even go to their YouTube page. You’ll find out that Infochammel seems to go almost out of its way to want to tell you what it is. Yet, at the same time contradicting and disproving itself leaving you with…. Something? The one thing that they do stress on Infochammel is wanting to send positive vibrations out to all of it’s listener audience by use of any means nessecary. Be it their proprietary encrypted “Tecno Loc” signal. Or simply sending out positive affirmations. Infochammel separates itself from the rest of the conventional streaming by focusing on the good while staying away from “Grimformation” as best as they can. Part of Infochammels anti-“Grimformation” stance is possibly what resonates the most with people who are watchers of the channel. Especially in the year this blog article was posted in 2017 because of the general state of mass-media. But the other aspects that viewers like is the mini-shows that Infochammel has. From the “Feminute” broadcasts, to “Totally Intellgent Machine”. There’s something that catches the eye of your average chammel watcher. It’s a network that may have started off as satire on not only mainstream media but the people who watch it. But it’s slowly evolving and moving to generating a life form of it’s own. Infochammel is incorporating other shorts from the Davy Force creation library. Also, with a play on words; Infochammel can state that they are the number one “Chammel” because they might be the only “Chammel”. At least for now! The underlying feel about Infochammel is that of nostalgia which is what we wish to talk about next. Gamers have this sense of nostalgia about them that when they want to play something old they would bust out a console from the 1980’s and use various adapters to plug it into modern technology. This nostalgia has an aesthetic to it as it references back to a time where things were more pure and absolute. There was no respawn in 80’s and 90’s games, you failed you must start all the way over. Which begs the question. If the gaming community can do it, why not the video editing community? You see video editors get their start on community broadcast TV and public access networks before moving onward towards independent projects. There’s a level of charm about community ran television. A lot of the work that goes into community television is actually their work instead of some giant conglomeration. To understand the nostalgia of Infochammel you must first understand the technology behind it. This is our simple teletext paint action. Because community television had to play by a strict set of rules where they can only air things where permission is given. Those editors had to get creative using technologies which by today’s standards even a $9 ARM computer can run circles around. They did this to fill time and keep the viewer engaged. No one likes dead air or staring at a cold and dark text only screen. Thus the first generation of this is a format founded in the 1970’s known as teletext. In the Americas teletext was not that big of a deal however in the UK it was massive in giving the public information about stocks, news, and sports updates all with 3-bit assisted graphics with a grand total of 8 colors. 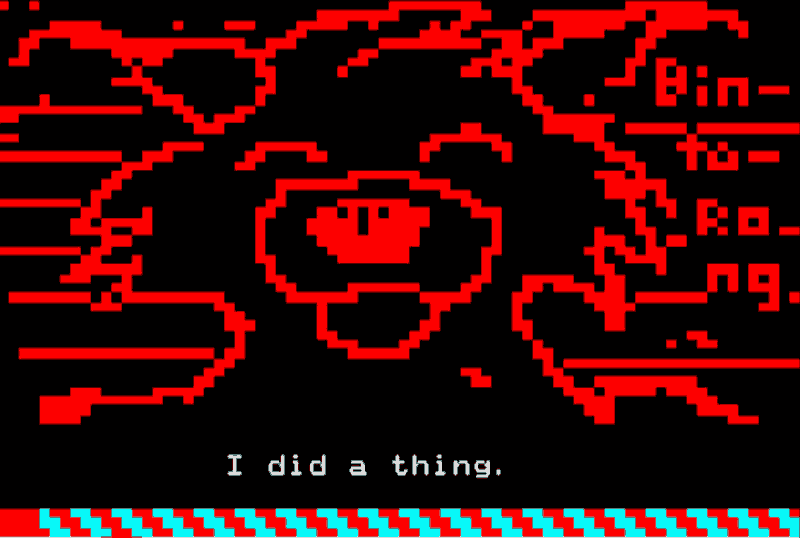 Click here to go to edit.tf and try your hand at the dark arts of teletext! Click here for another one by zxnet . We personally like this one a lot! Check out the Teletext Block Party if you want to see some examples of some super-great art with vintage tech. For those wondering what I made the graphic above. It was with the editor which originated from ZXnet. It has the nicest way of exporting data from it. Thanks! Click here to grab those original files. Like all of the files on my site the archive is in 7-zip for maximum efficiency. 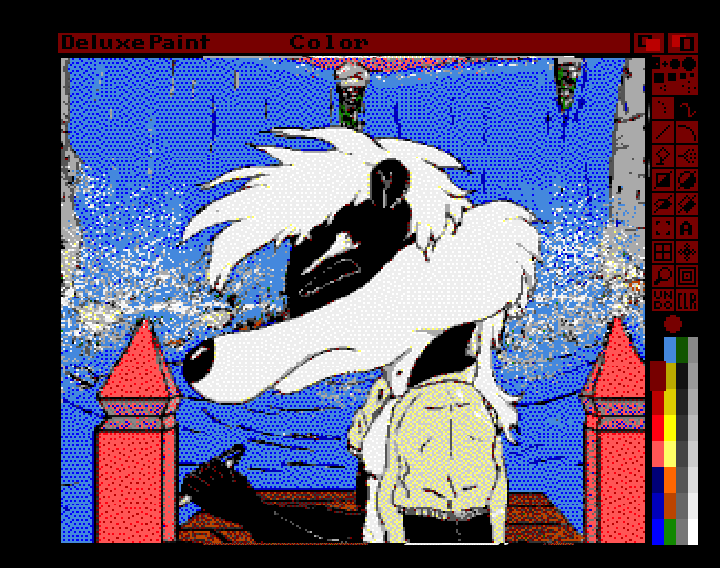 Example of Deluxe Paint available on the Amiga and PC/DOS. As technology advanced so did the graphics. Most notably was the 16 bit era of graphics where you had systems such as the Commodore Amiga running Deluxe Pant by Electronic Arts. Yes, before EA-Games turned into the fast food of gaming they were at the top of their game with releasing paint programs. Deluxe Pant had the ability to do animation as well saving a bunch of IFF frames in an ANIM-6 format. Therefore it was possible for the home user to make animation on a 7Mhz processor and about 1-4 megs of RAM. The downside of working with Deluxe Paint was the limitations of the chip-sets only allowed for a certain amount of colors depending on resolutions of these machines of the early 1990’s. 320×200 typically got you 64 colors maximum. and although there was the HAM-6 resolution (Through the use of another program known as Digi-Pant) which gave you 4096 colors on a 16-bit machine. It didn’t animate very well! This could be why Infochammel is so hung up on colors! Because colors back then were everything! The reason why video editors latched onto the Amiga more-so then any other system on the market is while IBM was moving towards EGA/VGA graphics which runs at a 15kHz signal. The Amiga can alternate between 60hz (NTSC) and 50hz (PAL) making this computer the perfect fit for analog video production. There was no need to expensive hardware to down convert a screen that you see on your computer over to a television signal. Impact of 16-bit computers in the video production landscape. 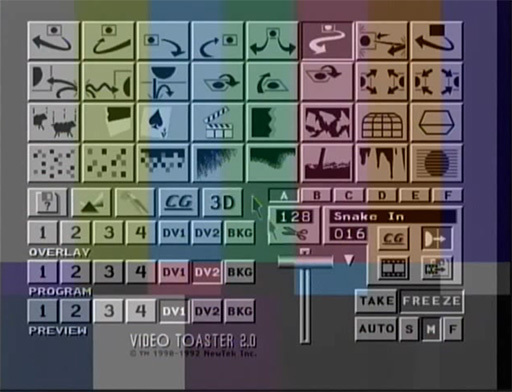 Although America missed out on teletext public broadcast there was a ton of channels which were using Amiga 2000’s in a slide-show style loop of videos. If you watch one of the earlier Infochammel satellite test signals it really has that Amiga feel to it all! Because some of these video titling programs weren’t the most elegant coded pieces of software in the world. As a result; Weird defects would happen such as if the text pan-scrolls off to the right the fonts would disappear before they hit the end of the screen. This is probably because depending on the compiled code the executable may not have had a library defining a view-port larger then the screen. If a font scrolls off the screen without a defined view port. The program crashes giving a divide by zero error. It’s video processing capabilities were furthered by the use of what is known as a “Gen-Lock” which allowed anything that is blue to be transparent on the screen. With the help of programs such as JacoSub this is how Anime pirates importers were able to send VHS copies of English translated subtitles to fans. A more moden term for this function in the adobe world is called “chroma-key.” The use of real-time gen-lock controllers didn’t have as much use in the digital landscape unless of course you were running a live news show thus the technology faded out of computers in general. If you look at NewTek’s site now you’ll quickly realize that video production walked away from the personal computer with their invention known as “TriCaster”. Using the computer as a basic controller instead of an integral part of its operating system. NewTek also took a back seat during the 2000’s as Adobe’s rise to power began with things like Flash, Photoshop, and Ultimately primer and aftereffects. With the Moores law of computing totally taking hold we now have computers which can calculate fast enough to do post production from the home. Suddenly, there was no need for Hollywood. If you have enough time you can mash it all together by yourself! Davy Force proved that with just a few people and a lot of technology both new and old you could be a one man network! Which is insanely impressive on so many levels. By painting graphics as if we were in the 80’s and 90’s. But letting the color pallet go 1 million colors of ballistic for present day. It gives us a window of what it would be like of Public Access Cable existed on the internet. Moving forward onto Twitch that is exactly what Infochammel is doing now! The public/private cable access service run by the famous Fred Furner which the viewers know of only from when he speaks to us. On how he wants to be our friend. Fred is the driving innovator of his television station with the vision of how information should be transmitted for the future. 11,000 years to be exact! Of course how Fred Furner manages to attain mortality for 11,000 is up for debate. But lets not be dragged down with the details shall we? Where does this blog fit in on all of this? CLASSIFRIED X Pro – GET!!! We like to be classy and deep fried! Professionally X Rated! We loved Infochammel so much that we thought it would be a good thing to place our hard earned advertisement dollars into! 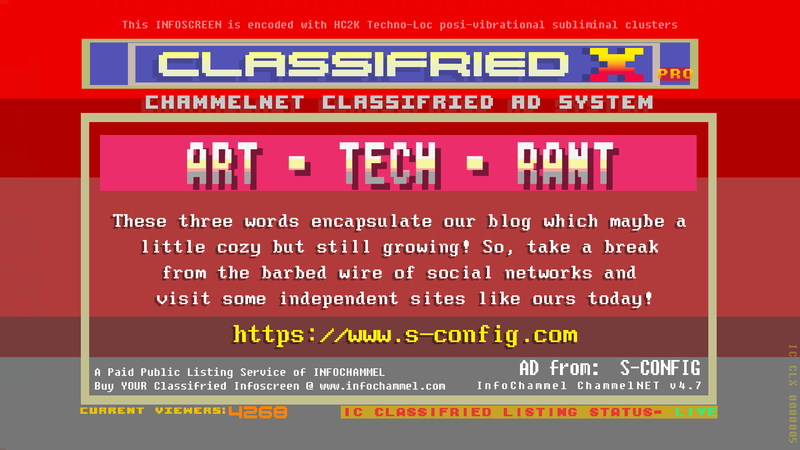 With permission from Infochammel we are proud to re-post our “CLASSIFRIED X Pro” advertisement on our site as well! This advertisement is now streaming on the Twitch Infochammel Teleborg stream and will be running for the next 11,000 years. It was hard coming up with a slogan for a blog. But we did our best and now no one can tell us that we don’t advertise this site anymore! Always reach to the PURPLE! Infochammel was kind enough to even throw in a free “PowerScreen” which is super nice of them to do. Although I had no idea what to type in as we weren’t expecting it! We decided it would be best to go into crazyville. We made fun of a certain “Orange Drink” company that has children rushing to the fridge to push away a tub of purple stuff. It made me wonder. What if purple stuff had a voice? Now it does on Infochammel! We feel that Infochammel is on to something unique in the presence of how media and the internet is intertwining itself. Although they don’t have many watchers and listeners right now this could just be something that is a little ahead of its time. That as public broadcasting goes to the wayside that Infochammel may be the community network the world needs. It is hard after-all getting the word out about your blog or new video that you produced and everyone needs that push and help just like TV editors needed during their internship at the local broadcast station. Here’s to hoping Infochammel will grow into a network of strange and wonderful shows. What is the turnover of an advertisement on Infochammel? Public/Private access advertisements on chammel streams is groundbreaking. We look forward to season 2 if Infochammel which is in production at the time of this blog article. In addition to new content creators submitting videos into the Infochammel universe. We are sure going to have a crazy ride coming into 2018! Until next time, that is what server said.